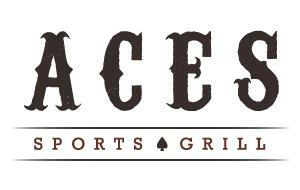 Come enjoy your favorite food and drink items at Aces Sports Grill! This full-service restaurant and bar is open seven days a week. Be sure to check out their all new menu packed full of mouth-watering goodies. Kick back at our full-service bar and enjoy the seven 42-inch and one 60-inch high definition TVs, perfect for viewing the big games. 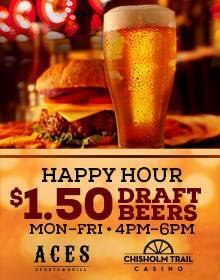 Sunday-Thursday: 11 a.m. – 12 a.m.
Friday and Saturday: 11 a.m. – 1:30 a.m.
Everyone likes to kick back after a long day. 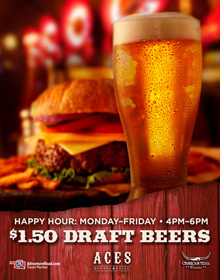 Join us for Happy Hour and $1.50 draft beers from 4 – 6 p.m. Monday – Friday.